Grow your business with Pro.Calendar - the organizer for business owners, real estate agents, freelancers, contractors, and project managers! Unified views for all calendars, appointments, todo lists, checklists, tasks, reminders for managing work and life in one place. Pro.Calendar is a smaller version of LifeTopix. Start powerfully, add what you want. 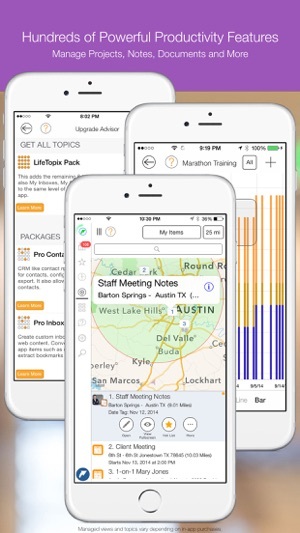 Discover ALL our features with our FREE LightArrow Organizer on the app store - that has a 100 item limit. NEW! Modern Dashboard - available with the LifeTopix Pack. Improve the visibility of your daily events with a unified, intuitive and easy-to-read calendar. Includes list, day, week, month and year views with fast switching and customizable view choices. Perfect for busy entrepreneurs, small business owners, parents, students, GTD® enthusiasts and anyone else who wants to stay organized and on top of their daily agenda. 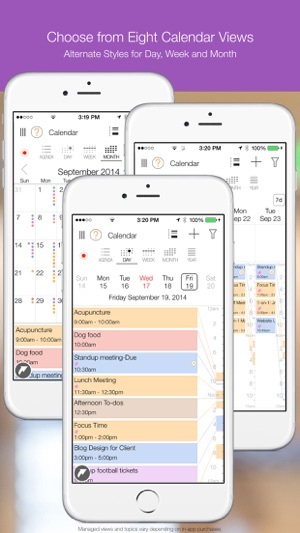 Pro.Calendar is the Complete Calendar Edition app of LightArrow’s LifeTopix. Start with calendar-relevant topics, and grow with optional in-app purchases. 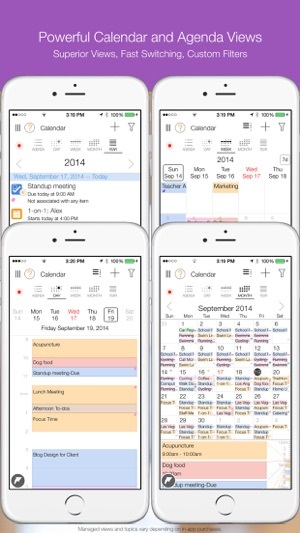 Pro.Calendar works with any calendar that your iOS device calendar supports including iCloud and other online calendars. 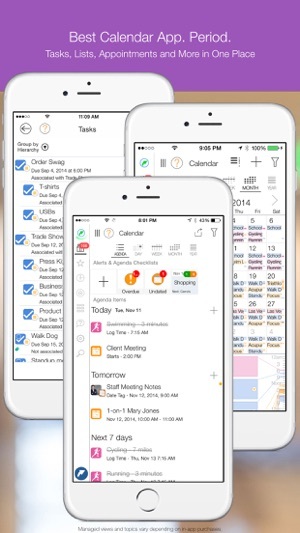 Create iOS reminders and iOS calendar items directly from Pro.Calendar and view these items unified in Pro.Calendar. Add invitees from your iOS contacts. Pro.Calendar includes a printable agenda and day, week, month and year views - configurable to individually show or hide your life and work events, such as appointments, health stats, tasks, trips, projects, checklists (to-do lists), notes, events from device calendars and more. Effortlessly switch to and from your views and easily search for any data item. 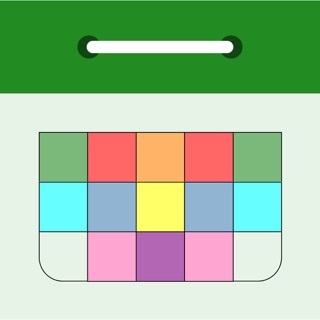 Calendar item types and events from different calendars are color-coded for easy identification. Associate notes from Evernote® and Toodledo® to projects, trips, goals and more. Associate tasks from Asana and GDrive to Pro.Calendar projects, goals and more. Link up files in Dropbox™, Box™, OneDrive™ (SkyDrive), and GDrive to Pro.Calendar projects, goals, events and other items. 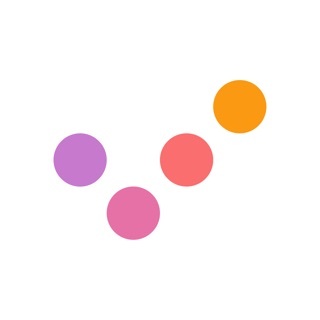 Instantly share and collaborate on items such as tasks through email. Discuss your items via Facebook, Twitter, and SMS. Create custom daily, weekly and monthly schedules. Create custom schedules for specified days of the week. Designate a number of occurrences or use an end date. Includes task and project management; events and appointments; travel; health, fitness and goals; notes, files and checklists; and media (audio and video). In-app purchases allow for additional topic items and views. Comprehensive note-taking and file management included. 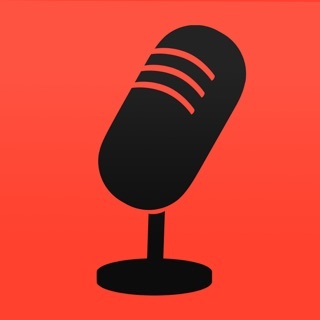 Record and add audio and video, add photos and hand-write and draw with your finger or stylus. Drawing tools include 48 colors with alpha options; line widths; eraser; clear; undo; and email for drawings. Printing is also available for notes and drawings. Customize your local notifications from Pro.Calendar to remind at custom times. The device calendar is used for local notifications allowing you to take advantage of the Notification Center. 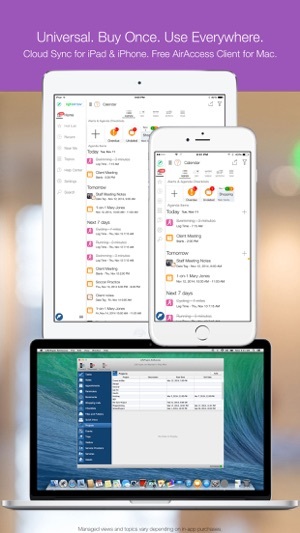 Supports device-to-device sync to keep data on your multiple iOS devices the same by using a free Dropbox or Box account, as well as with our LightArrow Organizer for Mac. Enjoy one-tap access to calendar items that are in the vicinity of a selected or current location. Powered by a 3rd party location-based social networking service, you can search for entertainment, events, food, shops and more. If you have an issue, give us a chance to help, you will be pleasantly surprised! This is a strong robust and terrific application. Does pretty much everything I want to do, however added modules for adding contacts etc. or just to spendy for me at this time. I have really begun to rely on this app because the features I like were very intuitive. Give it a try. © Copyright 2010-2018 LightArrow, Inc. All rights reserved.